Google CEO Sundar Pichai admits he’s not a big gamer, but he’s got big plans for gamers around the world. Today Google revealed its new game streaming platform, Stadia, with a stated goal to bring the best games to everyone in the world. “When we say for everyone, we really mean it. It’s one of our most cherished values at the company,” Pichai says. Here’s everything we know about the platform right now. The Google data center network powering Stadia covers 19 regions, 58 zones, and 200-plus countries and territories, bringing the 4K, 60-fps games to 2 billion people via any device using the Chrome browser. This includes desktops, laptops, phones, tablets, and televisions. This means players can bring games like Assassin’s Creed Odyssey anywhere they take their devices and pick up right where they left off. The tech blades powering the Stadia experience in these data centers are formidable. While the PS4 runs at 4.2 GPU teraflops and the Xbox One X at 6.0 GPU teraflops, Stadia runs at 10.7 GPU teraflops. It also supports Unreal Engine 4 and Unity. Id’s Marty Stratton said Doom Eternal already runs on Stadia at 4K with HDR at 60 fps. In the future, the service will support 8K resolutions and 120 frames per second. The Stadia service works with existing USB controllers, or mouse and keyboard. 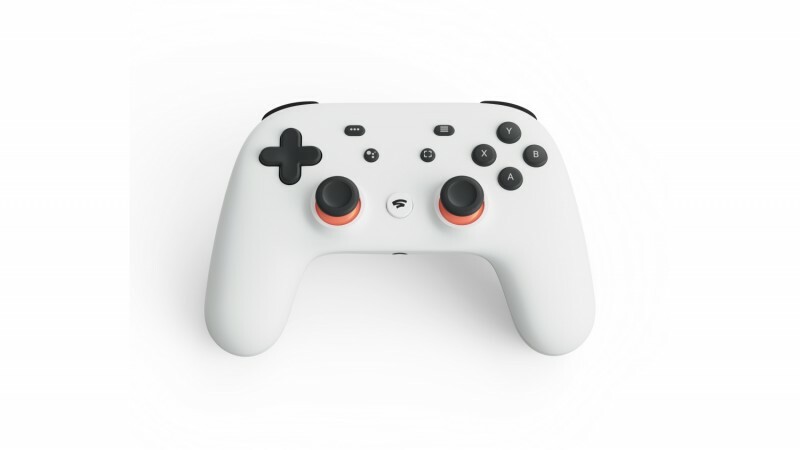 Google also designed its own matte white controller, which connects through Wi-Fi directly to the game that is running in the Google data center to ensure the highest possible performance. The Stadia controller features two new buttons. The Capture button is for sharing your play with 4K resolution at 60fps, and the Google Assistant button allows players to access the controller’s built-in microphone to get help when they are stuck directly from the A.I. assistant, which can immediately pull up a walkthrough or offer advice. How Does Stadia Integrate With YouTube? The Stadia technology connects directly into YouTube, allowing players watching a game stream to click a ‘play now’ button and be playing within five seconds. The Crowd Play feature allows content creators to stream directly through Stadia and even drop viewers right into their multiplayer session or queue them up for the next match. Using State Share, developers and streamers can share game states that drop players directly into a moment or challenge for any game on the platform. Developers and creators can build as many sharable moments as they want. Q-Games founder Dylan Cuthbert developed an entire game around this new technology that will be revealed later this year. Google VP Phil Harrison says Stadia supports cross-platform play and can migrate saves from pre-existing platforms. However, he did not reveal which consoles or services are supported. What Games Can I Play On Stadia? Hundreds of publishers and studios are currently migrating games to Stadia. Bethesda, Ubisoft, Take-Two, Q-Games, and Tequila Works all participated in the presentation. Does Stadia Have Exclusive Games? Google hasn’t revealed any playform exclusives, but the newly formed Stadia Games and Entertainment division headed by former EA and Ubisoft exec Jade Raymond is committed to creating games specifically for the platform. The service launches later in 2019, first in the United States, Canada, United Kingdom, and parts of Europe. How Much Does Stadia Cost? We don’t know just yet. We expect details to be revealed this summer, but sources say this is a Netflix-like subscription service and not a regular marketplace like Steam. Stay tuned as the week continues for more details on Google Stadia.